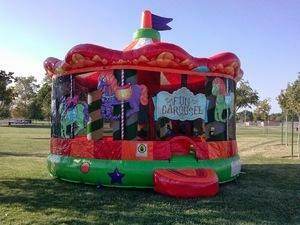 The Carousel 20x20 is sure to make any indoor or outdoor event a great success! This colorful bouncer will amaze kids and adults, and will keep your little horses going round, jumping, and playing for countless hours. This unit is great for festivals,company picnics,family reunions.